One of my earliest posts talked about how food was a uniting force in an interfaith marriage. I want to return to this discussion on food today because food is one of easiest expressions of culture to export. When immigrants leave their homeland, they leave behind their networks, childhood homes, and all that is familiar—except food. Globalization has resulted in easy access to exotic spices, putting native dishes within reach for immigrant communities. First, the products can show us what Pakistanis, Indians, Bengalis, and Guyanese West Indians hold in common food-wise—given that they all share a common heritage. Second, the ownership is Bengali, so the products for sale can tell us how the other cultures are viewed by a particular immigrant group. Image: Sign at the back of the grocery. So let's take the first point, shall we? What do the products for sale tell us about commonalities between Pakistanis, Indians, Bengalis, and Guyanese West Indians? Pakistan, India, and Bangladesh share close ties on the subcontinent. Though these nations are home to different societies, they share a cultural heritage cemented by history, geography, and climate. Social elements, such as diet and dress, were established centuries ago before these places existed separately when the people of the region determined strategies for managing daily life. Guyanese West Indians hold this heritage in their history, but they have also been exposed to varying degrees of assimilation as both indentured laborers and voluntary immigrants. Despite the political, religious, cultural, and geographical differences that now separate these people, they share a food history. Rice is a staple in Indian-based diets (and in the diets of many people around the world). Mannan has a respectable aisle of rices from various regions. Rice originated in South Asia and parts of Africa, however trade has spread rice cultivation throughout the world. It is a resilient species, and can be grown almost anywhere. Curry dishes are also very popular. Curry refers to the sauce that accompanies a dish, which is made from a combination of spices, including turmeric, cumin, coriander, and red pepper in addition to other spices that can change the character of the dish—not all curry dishes are spicy, for example. The practice of "currying" a dish has been widely exported, in part as a result of colonialism, resulting in many different adaptations of the base spices listed. Image: A collection of Indian curries. Achars (pl. ), or Indian pickles, chutneys, and pepper sauces are important condiments that have also survived and spread with colonialism and trade. They add a spicy or sweet addition to any dish, and some can even be eaten by themselves as a snack. Image: Pepper sauces are particularly popular in the West Indies. Food preparation techniques are also shared between these groups. Mannan carries an wide range of cooking implements, such as the tawah, which is used to prepare assorted flatbreads, known as roti. The dough for roti is rolled out on a chakla. Traditional chaklas are made from stone, but wooden ones have become fairly popular for their portability. The chakla provides a stable, even surface to work the dough on. Image: Wooden chakla and rolling pin. These similarities demonstrate an acknowledgment of a shared heritage. While these groups may not otherwise interact, in a foreign environment their shared histories and traditions bring them together in commerce. Regarding the seond question: What does a Bengali-owned Pakistani, Indian, Guyanese, Spanish, and American grocery reveal about perceptions concerning others—namely the host society? It's an interesting revelation because 95% of the store is devoted to South Asian ethnic products. Therefore the "American" items they choose to sell must be significant. They tell us how American's are perceived. The biggest "American" aisle was stocked with assorted pastas and tomato-based sauces. Now this does not mean that all that Americans are perceived to eat is pasta and sauces, but it gives us the sense that the owners of this establishment and perhaps the patrons as well believe that this is what Americans would most likely be looking for if they entered this store seeking "American" products. Perhaps the idea is that some harried mom needs a quick dinner or a jar of sauce and can't make it to one of the other groceries which are farther away. They are marketing the product they think may sell. Image: Assorted pastas in the "American" foods aisle. Multi-ethnic groceries are a goldmine for cultural information. The next time you're out and you come across one, don't hesitate to head in and browse. Pay attention to what's on the shelves and you'll learn something about your fellow shoppers. And your own supermarket, even if its a generic one may have some interesting truths to reveal—particularly if you have an ethnic representation in your neighborhood. Is there anything interesting on the shelves at your local grocery? It would be interesting to go back in six months and see what changes as the owner gets a better sense of what does and doesn't sell. Thanks, Wendy. And that's a great idea. It would be interesting to see how perceptions are shaped by economics—and it fits well with a project I am working on about food and identities. You're viewing this from a "too ethnic" point of view. You're forgetting that these are Bengali-Americans and pasta does sell. You are perceiving things as more exotic than they are. 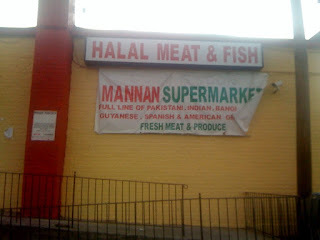 I am a Bengali American, living in NY and I shop at Mannan. Maybe you need to look beyond the few Bengalis/Indians/Pakistanis/ West Indians you know. Fariha, thank you for your comment. Yes, pasta does sell, but the point of the post was not to question whether or not Bengali Americans eat pasta. Certainly, there are many groups who enjoy pasta. The idea was to view the representations created through the management of particular items—to look at the way concepts of race and ethnicity are created and maintained.